When the cold weather hits, I’m always looking for interesting things to do indoors. Here are a few museum exhibitions that caught my eye. If only I had my own private plane, I would lace up my boots and visit each one. Now through March 15, 2015, visit the V&A in London to see romantic and iconic wedding dresses. For anyone who still enjoys putting pen to paper, this is for you. This small display explores some of the objects used in writing, from a medieval penner to an ingenious 18th century globe inkstand. This exhibition runs through April 19, 2015. This exhibition at The British Museum in London, focuses on the printed propaganda that either reviled or glorified Napoleon Bonaparte, on both sides of the English Channel. It explores how his formidable career coincided with the peak of political satire as an art form. The Fashion Museum in Bath holds a world-class collection of contemporary and historic dresses. Now through January 1, 2016, you can see over 30 original 18th century outfits and ensembles drawn from the museum’s collection. 2015 marks the bicentenary of the Battle of Waterloo and The Fan Museum in Greenwich, London has an exhibition that includes fans printed with portraits of heroic figures like Nelson and Wellington. The exhibition runs through May 10, 2015. This is a great exhibition for anyone with a fondness for footwear. 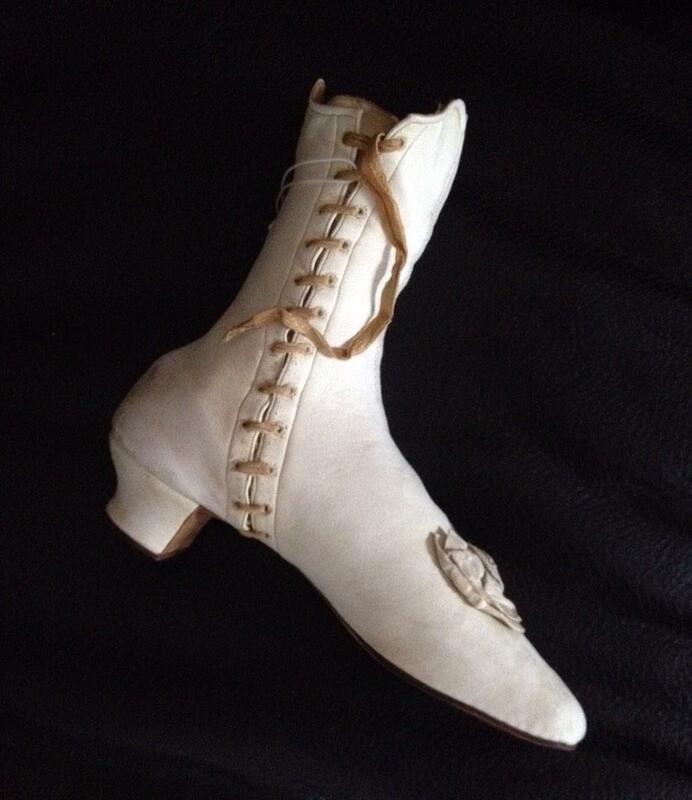 The Portsmouth Athenaeum in Portsmouth, N.H. is presenting an exhibition on the process of how shoes were made, sold, and worn in New England. Some beautiful shoes are included in this exhibition. It runs through June 5, 2015. If you love Downton Abbey, you’ll love this exhibition. The curators at the Biltmore Estate in Asheville, N.C. have installed 47 costumes from the television series throughout the rooms of the house. As you wander the halls, you will see both the upstairs and the downstairs portions of life from Downton Abbey. The exhibition runs through May 25, 2015. This exhibition examines the extraordinary ways in which women and men have shaped their bodies into distinctive silhouettes in the name of Fashion. The Bard Graduate Center is located in New York City. This exhibition runs from April 3 through July 26, 2015. The National Gallery of Art in Washington D.C. has one of the largest and most refined collections of early American furniture. This exhibition is now part of their permanent collection. The Legion of Honor museum in San Francisco will present an exhibition that reflects the 18th century vogue of portraiture and caricature, and the rise of landscape painting. This exhibition will run from July 18, 2015 through November 22, 2015. If there are other exhibitions you are excited about seeing, please let me know. And if you are lucky enough to catch any of these exhibitions, I’d love to hear about it.